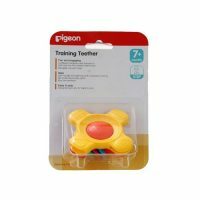 Pigeon Training Toothbrush L-2 is used for babies over 11 months with 8 to 10 milk teeth, its rubber bristles are soft enough for baby’s gums. PACK SIZE: toothbrush in one box. FEATURES: Toothbrush Set can be used for all stages of tooth growth. Lesson 1 Toothbrush has a safety shield for practice in baby’s mouth. Lesson 2 Toothbrush has rubber bristles that are soft enough for baby’s gums. Introduce Lesson 3 Toothbrush after all milk teeth have appeared. The rounded bristle-ends are tender and gentle on baby’s gums. Pigeon Baby Training Toothbrush (Lesson 2) toothbrush is used as a transition to familiarize babies with the brushing movement when brushing teeth. Recommended for babies over 11 months with 8 to 10 milk teeth. The soft elastomer rounded heads are soft and tender to baby’s gums. The fine bristle-ends allow cleaning for all teeth as well as in between the teeth.